Ellen Cove Jetty also known as Middleton Beach Jetty is a jetty found at the southern end of Middleton Beach in King George Sound in Albany in the Great Southern region of Western Australia. The Jetty was originally built in 1900 as an alternative to off-load supplies and stock, as some larger ships could not navigate the entrance to Princess Royal Harbour and use the main port. Once port facilities improved the jetty was no longer used for this purpose. It is now primarily used for recreational purposes. It is a popular swimming and fishing spot, and an iconic part of Ellen Cove featured in many photographs of the area. This image belongs to the travel and nature stock photo library. 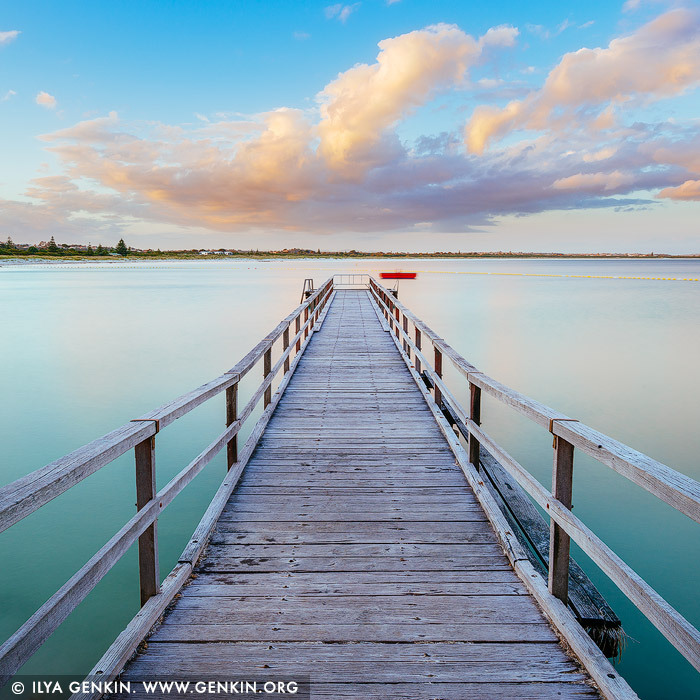 This stock photo of Ellen Cove Jetty at Sunset is available for licensing for commercial and editorial uses including websites, blogs, books, magazines, brochures and advertising. Restrictions may apply for images which contain third party copyrighted material or sensitive subjects. Photos of artwork are for editorial use only. This image id AU-WA-ALBANY-ELLEN-COVE-JETTY-0001 of Ellen Cove Jetty at Sunset, is copyrighted © by Ilya Genkin. This is not a public domain image.